Yes the signature will show on the pad for 3-4 sec. The signature pad comes with the added feature of an LCD interactive display. The monthly fees includes the pad and the replacement warranty. If your need change, simply return the pad and the monthly billing will stop. 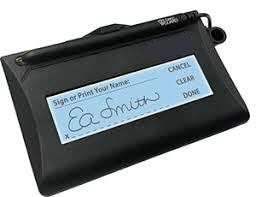 NOTE: the pad display the signature when the customer is signing, it will be transferred to GEM-CAR.